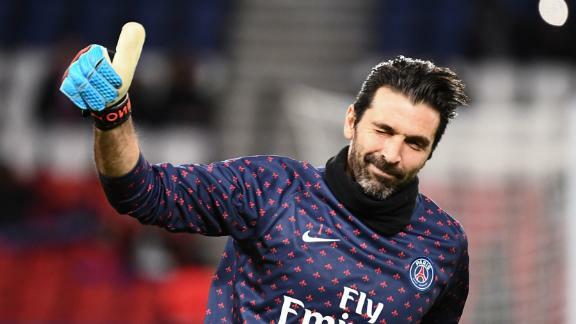 "I think this is a problem for us," PSG goalkeeper Buffon told CNN in an exclusive interview ahead of Tuesday's first leg at Old Trafford. "I'm not sure if it's a big problem or a little one. I hope it's only a small problem and that we are nevertheless a team that can thrive without him, it would give us great strength and confidence. "But I must say that without a player of Ney's caliber, it's going to be heavy going, particularly because in the last two or three months he's in excellent condition both physically and mentally and would have been of enormous help. "But nevertheless we have to do our best in order not to have any regrets and play the quarterfinals and semifinals with Ney back. "This would be the best present we could give to him, and I'm sure he would return the favor by playing in those two matches." Read: Is it time to sympathize with PSG's Neymar? The two enjoy a close relationship with Buffon keen to pass on his experiences to the prodigious young talent, even if Mbappe cheekily refers to him as "grandpa." "It's only normal that Kylian, who is 20 and thinks of me as a father figure or even a grandpa, but I think that's nice," Buffon said. "I've experienced so many wonderful things in my career. Firstly as a young, adolescent cocky player who was surrounded by older players and my mission then was to be accepted by them. "Then as a young man, and lastly as an older man who meets a young man who was just like me when I was the same age. "And when I joke about with Kylian we have a friendly rapport and it feels like we're the same age. The way I see it, we have to find common ground and I have to act in a younger way and he has to think along the lines of someone slightly older perhaps." While Mbappe may have several more opportunities to win the Champions League, Buffon's future is more uncertain. "I don't know," Buffon, who signed a one-year deal and has an option for a further 12 months, said when asked about his future. "The opportunity may well present itself, but nothing has been carved in stone. I think that a player like me and of my age shouldn't make long-term plans."